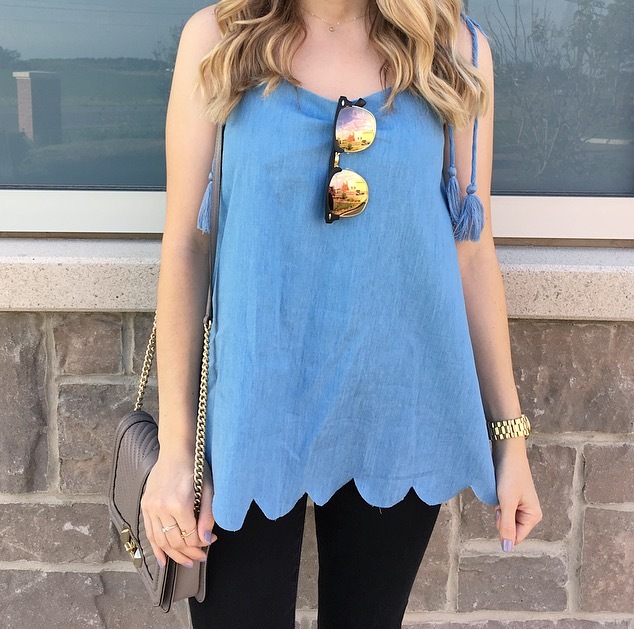 Paige Shealyn: Little Chambray Tank! When it comes to tops Chambray is one of my favourite styles to buy. They go with everything which makes it so easy to wear them with everything you already own. It's never a bad thing to spend on pieces you will actually get a ton of wear on. I'm teaming up with Shop the Mint for today's post. I got to try this adorable little tank. I think it's great for Summer but will also go well under cardigans and jackets throughout the Fall. I'm wearing a size small for reference (it does fit loose and pretty flowy on me). The straps are tied - so you can tie them to how you prefer. You can check out more of their cute styles here! Also if you sign up for their emails you receive $10 off your purchase. As always thanks for reading and don't forget to follow me on Instagram @paigeshealyn ! Enjoy your day! Disclaimer - this top was gifted to me from Shop the Mint in exchange for this post. All opinions are my own.